Count data from the main crane sites on www.grus-grus.eu. This link takes you to the English version of the website for the Champagne-Ardenne group of LPO (in French and English). 'Crane Country' film here (on the The Great Crane Project website) or here (on the RSPB website), produced by Nick Upton and featuring an interview with John Buxton and some of his film archive (16 minutes, released 2010). Later 30 minute film 'Return of the Cranes' here (September 2012). 'Born to Fly' RSPB crane film by Nick Upton, 47 minutes. More details on the RSPB's website. 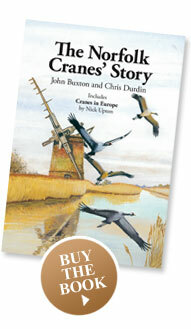 British Wildlife: Common Crane habitats in Britain by Andrew Stanbury and Norman Sills, British Wildlife, August 2012. Paper by RSPB researcher Andrew Stanbury and Norman Sills, site manager at RSPB Lakenheath Fen nature reserve until his retirement in 2011 (though he's as busy as ever). It can be read or downloaded here. 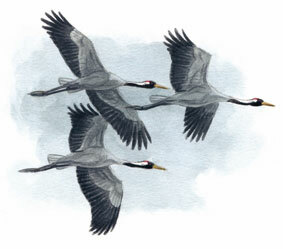 The Cranes of Lakenheath Fen by Norman Sills in British Wildlife, June 2017. The paper describes details of the two pairs here since 2007, including choice of nest area, incubation and foraging areas. A section on management stresses the risk of disturbance for this sensitive species and the value of predator control. British Birds: The Changing Status of Common Cranes in the UK by Andrew Stanbury and the UK Crane Working Group, British Birds, August 2011. The paper is summarised here (on BB's website) or can be read or downloaded here. Both complement (and refer to) The Norfolk Cranes' Story book. More on both papers on our news page. Management advice: as well as the papers noted above, here is an advisory sheet on management to help cranes, published by the UK Crane Working Group, the Great Crane Project and the RSPB. 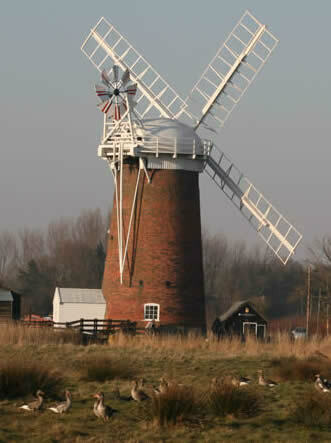 Horsey Mill, with greylags in the foreground. Nick Upton's photos: many are on the Nature Picture Library www.naturepl.com and RSPB Images www.rspb-images.com.